Did you know that besides for getting great coupons and cash back you could make money using ebates to? I know it sounds crazy but it is true! I am a stay at home mom of six so I am looking for every opportunity to save and make money. 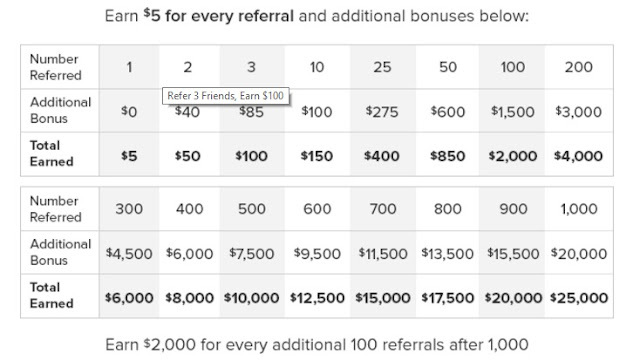 Ebates has a pretty awesome referral program. For every person you refer you will earn $5. I know that does not sound like a lot but that is just the base price. The more people you refer to ebates the more bonuses you can earn. Just check out the chart below as an example. The best part is you are helping people save money and they are getting a $10 bonus just for signing up and making a purchase of $25 at one of the 1,000's of stores! It's awesome!! It is a win,win! How to get people to join ebates? I don't think it should be very hard to find someone who shops online these days. If you know someone who shops online just send them your referral link. Like I said they will get $10 in cash or gift card plus they will save with the coupons and cash back. And it is all FREE! How can ebay pay me to refer people? Don't kid yourself they are making plenty of money. Ebates gets commission from your purchase and in turn are giving you a percentage of the money they make. So we all win. If you have not joined ebates yet here is the link to get your $10. Start saving and making money today!